Who knew there was a Pastel Society of America? Well, I knew. But to some, it is surprising to hear of an organization that is dedicated completely to the art medium of soft pastel. Then again, I’m sure all of you can think of organizations and societies that support the passions/interests/hobbies that make up your own extra-curricular lives, or those of your loved ones. Through my Mom, for example, I have learned that there are societies and conferences just for quilters. Why shouldn’t I have my own group of enablers? 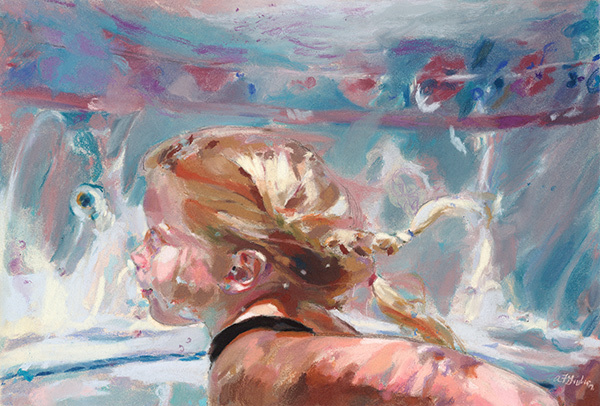 One of my favorite pieces in the 2013 PSA exhibition was this, “Jami Swimming II,” by Adrian Frankel Giuliani. Check out her work at www.adrianpastelportraits.com. I was probably in high school when I first tried out these dusty jewels, and loved them right away. Over the past year or so, as I have decided to pursue my interest in art with a bit more fervor, I have learned about an eye-popping array of professional artist quality pastels and surfaces. Compared to the student quality versions, using these is like stepping into a new universe. I am fortunate, therefore, to know where to turn to learn more about what these gorgeous things can do. Hooray that there is an organization that showcases the very best pastel artists in the country. After gazing at work by some of these pros online, in magazines (like The Pastel Journal, of course), and in my collection of their own educational DVDs, it was tremendously exciting for me to see the work of their hands in person last month in New York at The Pastel Society of America’s 41st Annual Exhibition: Enduring Brilliance. I even met the President of the Society, as well as some of the artists (including Adrian Frankel Guiliani, whose work is featured above). All were friendly and gracious, and I look forward to seeing them again next year. Here’s a tidbit for ya: these pastel paintings (yup, they’re referred to as paintings!) won’t darken, yellow, or crack over time like oil paintings will because soft pastels are almost pure pigment – the same pigments as in oil paints – bound into sticks instead of suspended in oil. Don’t get me wrong – oil paint is an incredible medium. And an oil painting, once dry, cannot be smudged like a pastel painting can. But when protected and properly cared for, pastel paintings look incredibly fresh and vivid compared with oil paintings from the same time period, which need to be restored. Look for works in pastel on your next art museum visit and you’ll see for yourself. 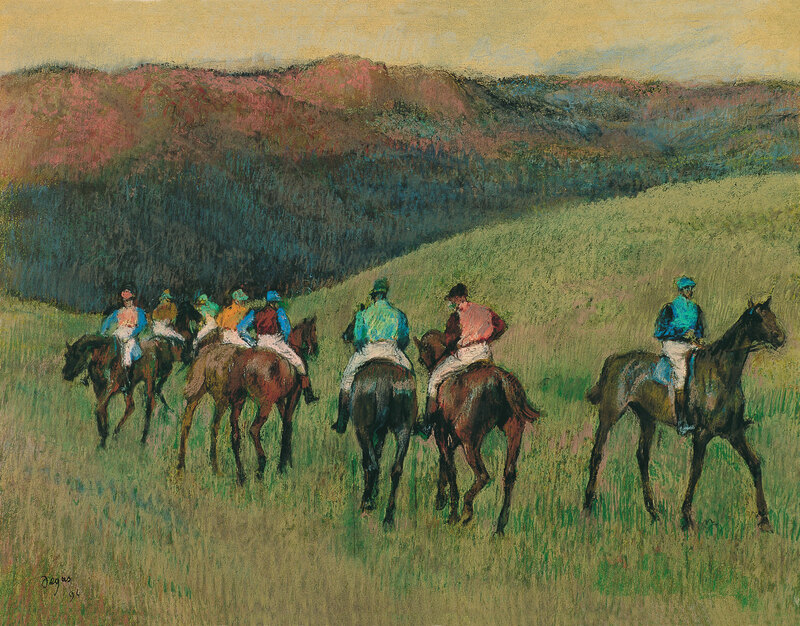 “Racehorses in a Landscape” – Edgar Degas, 1894, pastel on paper. On display at Museo Thyssen-Bornemisza in Madrid, Spain. So, what do you love to do, see, hear, eat, learn about, visit, or otherwise experience? Maybe there’s a society for it. Take a moment to find out. Meanwhile, take a look at the pastel paintings that were singled out for honors at the 2013 PSA exhibition, and watch for the next one in 2014. Enjoy! Filed under Fine Art, Nicole M.